Looking to bring a little customization into your bedroom? Then you’ll definitely enjoy this review, which is all about the Idle Air, an adjustable mattress whose firmness can change with the single click of a button. Okay, I admit, I was pretty intrigued by this description, too, which is why I hopped atop this bed and gave it a thorough once-over, putting it to the test to see how it worked and whether or not it could be the perfect mattress for you. Keep on reading below! Don’t have time for the full shebang? Skip on over to my review summary. The Idle Air uses adjustable air chambers to help you find the perfect firmness for you. Save $300 off your purchase by using code SLEEPOPOLIS! Idle Sleep entered the bed-in-a-box movement on a mission to bring customized comfort to consumers. And How? By introducing a line of double-sided beds to the market, which could be easily flipped and switched around to align with sleepers’ specific preferences. New to this adjustable venture is the aforementioned Idle Air, which utilizes air chambers to achieve different firmness levels. While we’ll spend most of the time in this review assessing the Air, we’ll also take a moment later on to compare it to another Idle bed (the Idle Latex Hybrid) as well as some of its biggest competition in the space: The Sleep Number I10 and I8 mattresses. But before we do any of that, we’ve gotta figure out what’s going on underneath the cover! What is the Idle Air Made Of? Standing at an impressive 14” tall, the Idle Air is composed of memory foam, latex, poly foam, and air chamber layers. While the first three materials may sound familiar to most shoppers, the fourth is a bit of a novelty in the space, and basically just means there are spaces in the bed that sleepers can fill with air to create a more or less taut (read: firm) feel. I should note that adjusting the amount of air in these chambers is simple — all you have to do is click the up or down arrow on the provided remotes. But enough chat! Let’s get into this bed’s construction. Comfort – The comfort section of the Idle Air begins with a layer that has memory foam on one side and latex on the other. This means the sleeper can flip the section around depending on their preferences; either for plush, pressure-relieving memory foam or bouncy latex. Regardless of the orientation, the sleeper is likely to experience a bit of sinkage into this layer, which will help to soothe aches and pains at the shoulders and hips. Transition – Up next, you’ll find a layer of high-density poly foam. 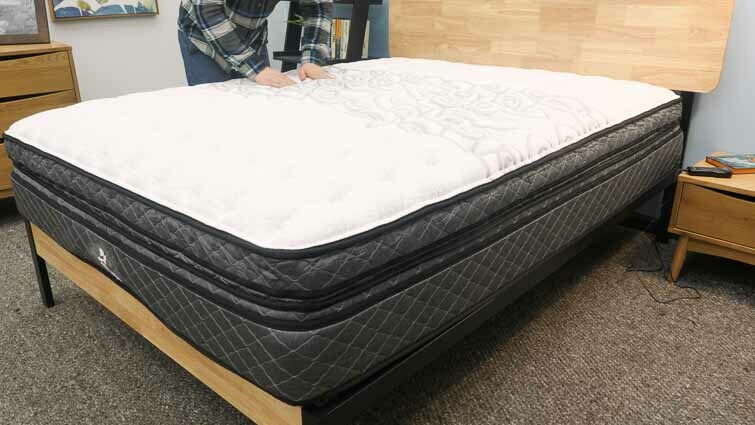 The main purpose of this layer is to help transition the sleeper from the gentle top materials into the firmer base below. This section is also zoned for posture support, with firmer foams at the hips for a bit of lift and softer ones at the shoulders for pressure relief. 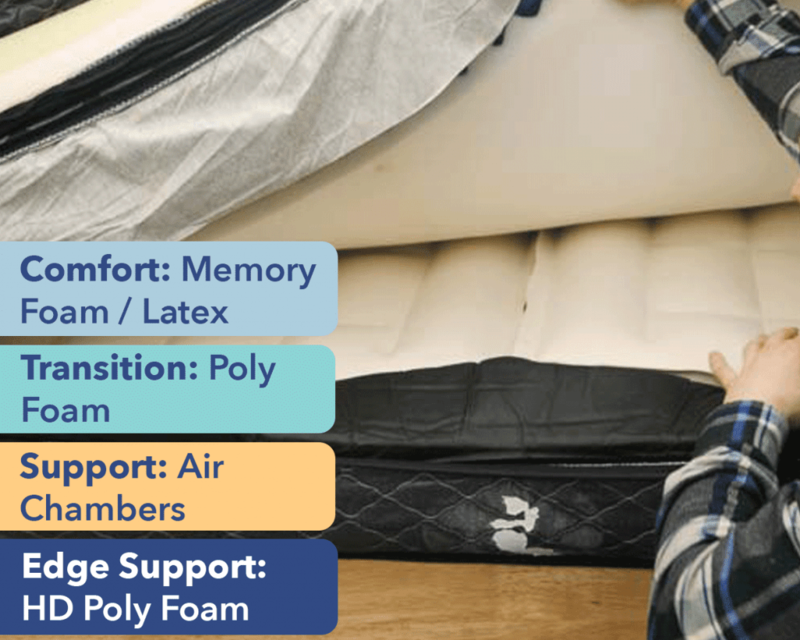 Support – The bulk of the mattress is comprised of the bed’s two air support chambers, which can be filled with as much (or as little) air as the sleeper wants! All of this is controlled by remotes attached to either side of the bed, so folks can modify their individual firmness without disturbing their bedmate. 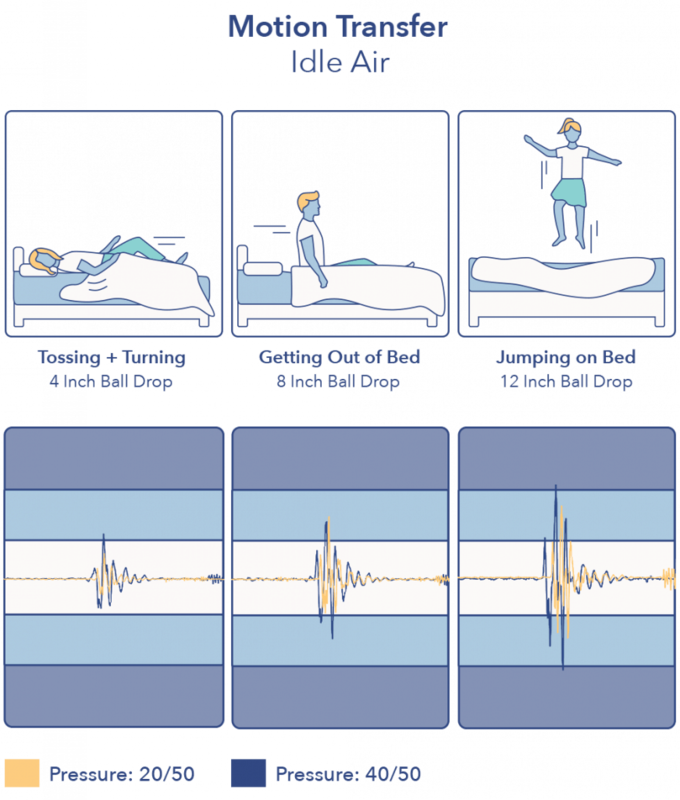 The idea is that more air creates a firm vibe great for back or stomach sleepers while less air produces a softer feel for deep pressure relief. Edge Support – All of the above layers sit snugly inside a firm ring of edge support, which brings a little extra oomph to the sides of the bed. What this means is that the surface area of the structure has been optimized so you can safely sit on the edge to tie a shoe or stretch out all the way to the corner when snoozing next to a restless sleeper. Construction specs aside, let’s get into how the Idle Air feels. To tee off this conversation, I want to chat about how firm the mattress is. To start, I pressed my hand into the structure and was pleasantly surprised by the softness of the cover and memory foam top layer. My fingers felt snug as they slowly sank into these materials, providing my hand with some pleasant pressure relief. As I pushed in more, I met the firmness of the air chambers, which, again, can be modified depending on one’s preferences. Normally at this point, I’d go into a whole spiel about how I determine a bed’s firmness by getting a bunch of different folks at Sleepopolis HQ to hop aboard and share their personal firmness ratings on a scale from 1 (super soft) to 10 (rock hard), but that doesn’t really apply in this situation. Why? 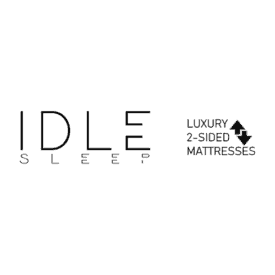 Because either side of the Idle Air can be adjusted on a scale from 0 to 50 (again, simply by clicking up or down on the attached remote). Whoa. Yeah, I know, it seems like a lot, but the differences in feel aren’t too dramatic. While a 0 is obviously going to feel much softer than a 50, the measurements in between really hover in the medium firm range. If I were to translate this to the 1-10 scale, I’d say the Idle Air can achieve a firmness between 4.5 at the softest setting to about 7.5 at the firmest. All that being said, I’d recommend the 20-30 range for side sleepers, 30-35 for back or combo sleepers, and 40-50 for strict stomach sleepers. Of course, you’ll have to play around with the levels to find that perfect fit, but that’s part of the beauty of an adjustable bed! The overall feel and firmness is also going to change based on the comfort layer you choose. Again, this section features memory foam on one side and latex on the other, so you can double down on the softness (or firmness) depending on how you configure the layer. 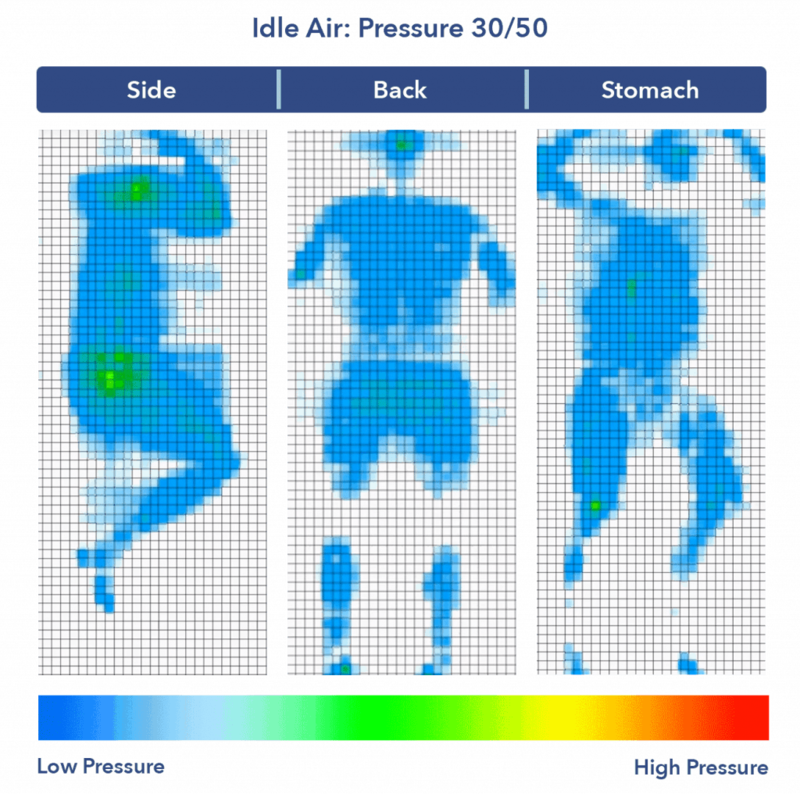 How Well Does the Idle Air Relieve Pressure? Firmness is but a single piece of a bed’s feel. Another major one is how well (or poorly) it’s able to relieve pressure at sensitive spots along the body, namely the shoulders, hips, and lower back. To demonstrate the Idle Air’s ability to alleviate tension, I stretched out on a pressure map, which creates a colorful graphic depicting how my body’s interacting with the bed in real time. Blue indicates zones of low pressure while red indicates areas of high pressure. Since this bed is obviously a little different, I conducted pressure tests at the 10, 30, and 50 levels. Back – Neither I nor the pressure map detected much difference between the three levels as I experienced fairly satisfying relief no matter the fill. The comfort layer did a nice job of filling in the space at my lower back for pressure relief while the other materials worked together to lift my hips up and out of the structure, making it easy for me to move around and change positions. Side – I thought the Idle Air actually did quite well on my side across the board. While there was some pressure build up at my shoulders and hips (as is to be expected), I was impressed by the ability of the plush pillow top to conform to these sensitive spots and buffer against the tension you’d normally see in this position. I wouldn’t recommend this bed for strict side sleepers, but it could be a good fit for combo sleepers who switch between their sides and another position. Stomach – Though the map didn’t pick up any pressure points, I did feel some slight discomfort on my stomach at the 10 and 30 levels. As I mentioned above, the 10-30 range represents a gradient from super soft to just about medium firm, which is typically a little too gentle for stomach sleepers as it sends the hips out of alignment with the shoulders. However, strict stomach sleepers should be totally fine if they make sure to keep things between 40-50. Now that we’ve started to get a solid grasp of the Idle Air’s unique features, let’s take a moment to compare it to some of its biggest competition on the scene: the Sleep Number I10 and I8 mattresses. Arguably the most popular air chamber mattresses on the market, these models actually have really similar designs to the Idle Air. However, the Sleep Number beds also come with a special Sleep IQ app, which helps to improve overall sleep hygiene (a nice touch, in my opinion). 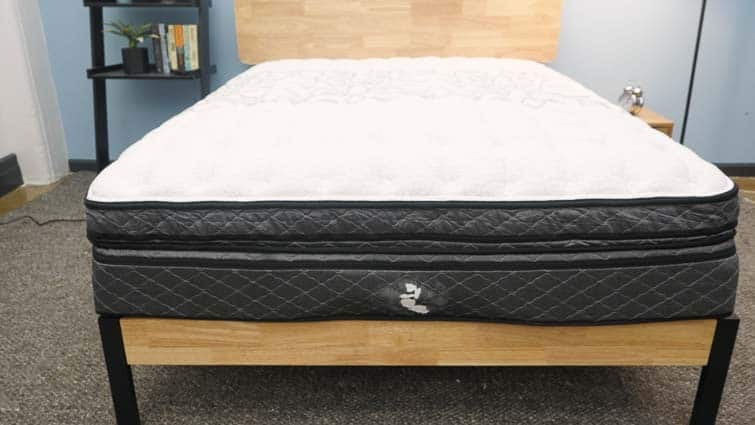 Though similar, the Serta beds are significantly more expensive than the Idle Air, costing $4,699 for a Queen as compared to the Idle Air’s price of $2,249. In addition to the Air mattress, Idle also has a few other models, including the Idle Latex Hybrid, which I’ve previously reviewed on the site. Below, I’ll break down the major differences between these two bed siblings. Aside from both being under the Idle umbrella, these two beds don’t really have that much in common at all. The Latex Hybrid is a flippable mattress built with latex and pocketed coils for an extremely bouncy feel. At $1,900, it’s less expensive than the Air, though price shouldn’t be a deciding factor between the two as, again, their feels are basically uncomparable. For more on the Idle Latex Hybrid, check out my full review. But enough with other beds! Let’s turn our eyes back to the Idle Air with a little motion transfer test. 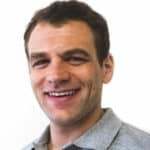 This section will help us determine how much movement will be detectable from one side of the mattress to the other, which could be an especially important factor for couples to pay attention. Not bad, not great, I wouldn’t say motion transfer is going to be a particularly desirable negative trait of the mattress. While the pillowtop layer does an okay job of dampening movement, ultimately you are likely to feel some tossing and turning throughout the night. Normally, I’d demonstrate this sinkage by placing four balls of varying weights and densities (a 6 lb medicine ball, a 10 lb steel ball, a 50 lb medicine ball, and a 100 lb medicine ball) on the mattress and measuring how much they compressed the surface. However, because the sinkage is really going to change depending on the fill you choose, I decided to skip this test. 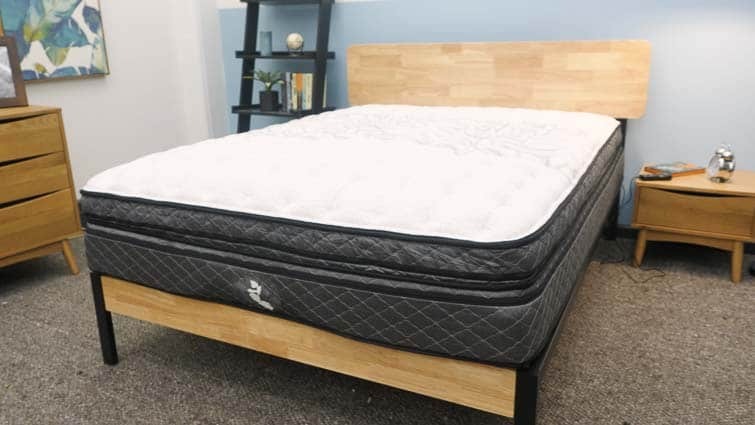 What I can say is that you’ll likely feel some slight sinkage regardless of the level you pick because of the soft foam top layers, but that you probably won’t feel too stuck in this mattress. As I mentioned in the firmness section, 0-30 is going to give you more of that soft, sinky feel while anything in the 40-50 is likely to give you more of an ultra-firm, positioned-on-top-of-the mattress vibe. 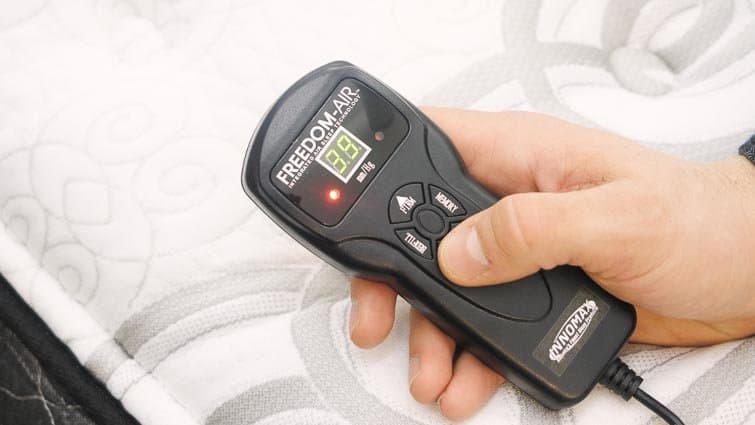 Is the Idle Air Mattress Right for You? Yes, no, I don’t know, now’s the time to answer that formidable question: Is the Idle Air mattress right for you? I can’t definitevely say (sorry about it), but I can provide you with some final thoughts to help you with your decision. If you’re looking for an adjustable air chamber bed, you’re not likely to find one at a better value than the Idle Air. Compared to its biggest competition on the market, it’s much less expensive. 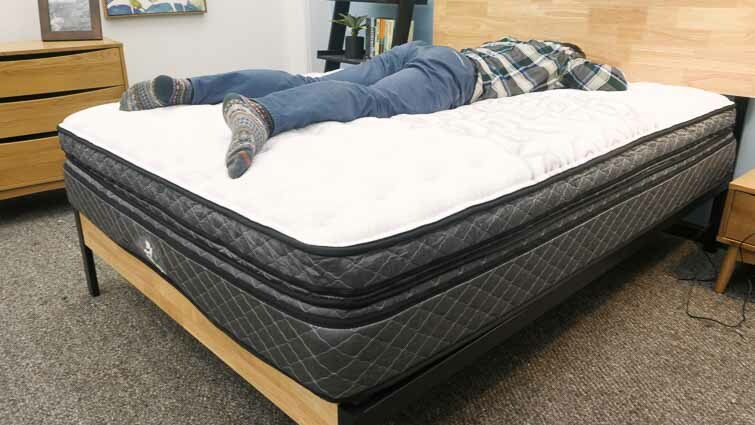 In that vein, if you’re after a dual-chamber vibe that allows both sleepers to modify their side of the bed, this could be a real winner for you. At the end of the day, if you want optimized adjustability, the Idle Air could be a nice pick for you. I actually found the remote was kind of slow to respond, which made for a very gradual shift between fill levels. I’d also say the bed “bubbles” slightly in the middle, making for a somewhat uncomfortable feel. And finally, I could feel the air decreasing little by little the longer I stretched out in one position, so would suggest keeping an eye on that.